At the end of the Civil War, Richmond, Virginia, is a blank canvas. Richmond’s social hierarchy is shattered by the abolition of slavery and its economic diversity is destroyed. Richmond’s fate dangles at the edge of a cliff. The future of Richmond rests in the decisions and opinions of those in power. In the years following the Civil War, Richmond’s blank canvas will be sketched, painted and redrawn to reflect the time period commonly known as “the New South,” defined by racial and economic infrastructure changes. One particular street reveals the smaller changes within the city that lead to Richmond’s larger identity in “the New South.” The West Duval Street from 1885 to 1923 experienced drastic changes. 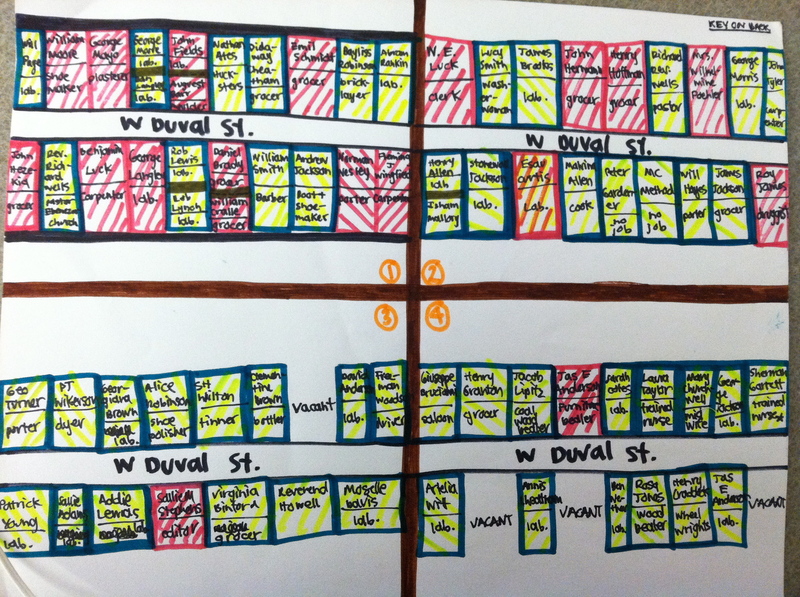 West Duval Street’s part of the canvas transformed from a united black and white laboring community to a segregated economically starved and predominantly black neighborhood partitioned from the white and commercial areas of the city. The rich white supremacy power in the city of Richmond that feared the power of the free blacks and more importantly, the powerful union between poor whites and blacks after the Civil War, drove this segregation in the city and doing everything to stop the labor union between blacks and whites. 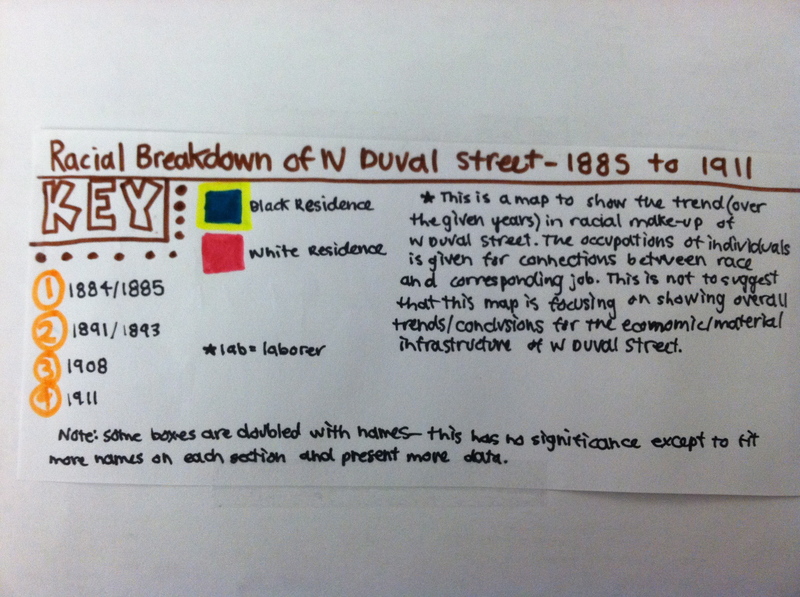 A mixed racial community of poor whites and blacks laborers made up West Duval Street in the 1880s. One of the biggest hubs of white and black unity on West Duval Street was the Mount Zion Baptist Church, which played a large role in energizing the moral of the residents after the Civil War. Previously stationed in an abandoned Confederate horse stable along the shores of the James River, the church’s construction, in 1867, on West Duval Street stood as a representation of the changing times which allowed the previously all black congregation for the first time to worship in public with whites. Blacks and whites from West Duval Street and the surrounding neighborhoods publicly praised the Lord together and showed their strength as a spiritual congregation. This union of poor whites and blacks threatened rich whites. Even more threatening to the rich white population in the city was the emerging black political strength in Richmond, including congressional representation. The Mount Zion Baptist Church stood as the moral center and foundation of the West Duval Street community thanks to the dynamic leadership provided by legendary pastor, John Jasper. John Jasper’s most inspiring speech, “De Sun Do Move,” first given in 1878, exemplified the power of his words, which he shared with congregations for over twenty years. The Richmond Daily Dispatch described how this speech resonated with blacks and whites all over the nation . John Jasper was one of the strongest inspirational roots to the unity of blacks and whites on West Duval Street and the Jackson Ward area after the Civil War to the early 1890s. The buildings around the church included barbershops, shoemakers, laundromats, building and carpentry firms, and grocery stores. 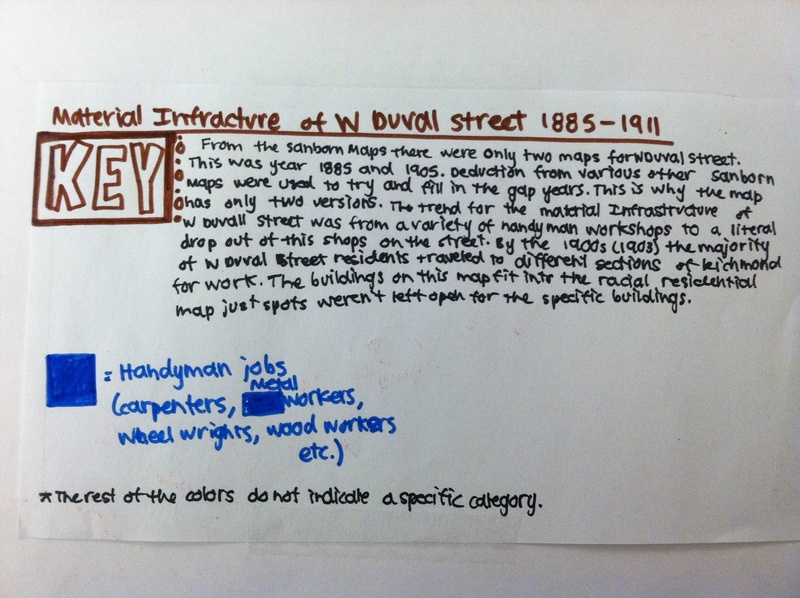 The residents of West Duval Street worked in these businesses and also worked as bricklayers, porters, washerwoman, hucksters, and most prominently laborers. Laborers filled the lowest level on the hierarchy of jobs within the city; as a day laborer, an individual lacked a steady paying job and took different labor jobs all over the city, as needed. In addition to biracial religious worship, poor whites and blacks also formed early labor organizations. In 1886, West Duval Street low-wage workers, bricklayers and carpenters united with the Knights of Labor, which became the largest bi-racial labor convention the South has ever seen, with upwards of 700,000 laborers fighting for equal rights and representation. Rich whites saw this unity between the two races as a threat to their own survival as the dominant race and power in Richmond. The moves of influential whites of Richmond of the 1880s, as they tried to control the blacks’ freedoms, riots, jobs, and neighborhoods through military action, failed to break the union because they still did not have the support of poor whites . In a University of Virginia article, written by Angel Price, he analyzes this tension between rich whites and the union of poor whites and blacks writing, “particularly after the Civil War, poor whites and poor blacks held a similar position in society. They typically worked as sharecroppers and tenant farmers, with no possibility for land ownership or education, constantly under the control of land owning wealthy whites. The upper class whites were aware of the power that working class whites and blacks would have if they were to join forces in political and social affairs. ” This led the upper class whites to encourage animosity between these two groups of people; the racial distinction reinforced the poor whites’ ideas about their superiority over blacks due to the color of their skin. This was the key to white supremacy’s later success in breaking up the black and white laborer unity. They knew just how to tap into the human weakness for power and tricked the poor whites, who earned the same wages as black men, to believe they were superior. In the 1900s this deception that poor whites were superior to blacks vividly emerged as the union between the biracial labor movement started to fade within the city of Richmond. A Richmond Planet article on October 10, 1903, describes a Labor League of Richmond meeting that sought to discuss moves for white laborers to gain political representation. The white laborers complained how those who labor are in majority in the city of Richmond and the State of Virginia, but are not represented in the law-making bodies. The descriptions of this meeting, however, not once mentioned representation for black laborers, for in the white laborers ignorance the poverty-stricken whites had become blind to the fact that their interests were identical to the colored man. The poor white’s acceptance of white supremacy motives is apparent in the constitutional acts they approved in their meeting that supported laws to keep blacks from any representation in politics. By the beginning of the 1900s the white supremacy movement created by rich whites had successfully destroyed the union between poor whites and blacks. These changes can be seen in the racial and economic infrastructure variations within the West Duvall Street blocks. Geographic and economic segregation are the result of the white supremacy’s movement in Richmond. After 1905, there are virtually no whites living on the block and the diversification of the businesses dwindles, as more and more black day laborers fill the block. The types of jobs seen on the street starts to change from skilled workers, like plasterers, molders, and bricklayers to dyers, tinners, and porters. The high moral standing and political strength in the black community of the late 1880s starts to dwindle as white supremacy suffocates any black power within the city. More telling of a transformation on West Duval Street, the moral and energy that poured out of the Mount Zion Baptist Church on West Duval Street had dissipated by this time as pastor John Jasper died in 1901. The strong, voiced, united energy of the black population in the 1880s is no where to be seen in the early 1900s because of the oppression of the upper class and middle class white population. 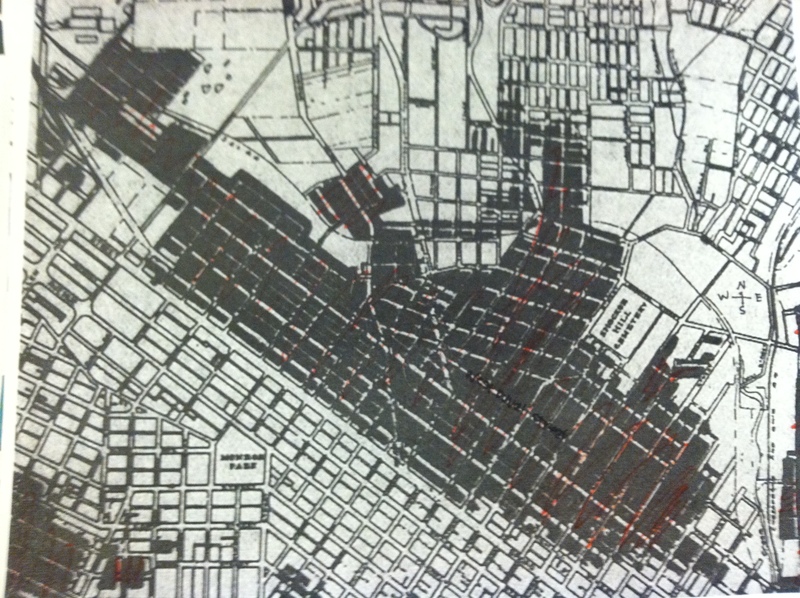 The segregated city of Richmond is clearly illustrated by a 1923 map, which is archived online, that shows black and white sections of the city in prominent white and red coloring. 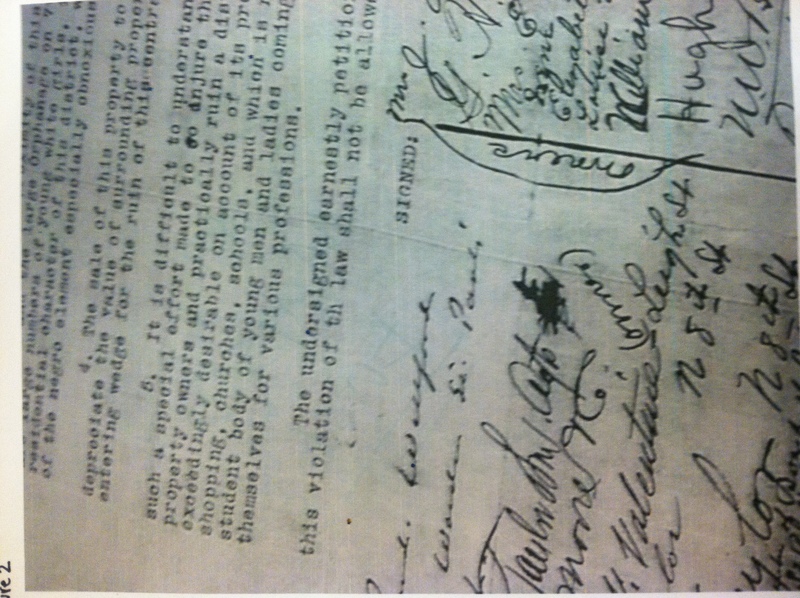 Amplifying this segregation is a petition signed by over twenty white congregation members of Emanuel Baptist Church who did not want the property at 5th Street and Leigh sold to Leigh Street Methodist Church, because this corner lot was a white block according to the 1910 residential segregation ordinance. Because this lot lay on the edge of the ordinance lines, the front door of the church was moved to the alternate street to satisfy the ordinance boundaries. The extent of the whites actions to keep in line with the ordinance depicts the deeply rooted segregation of the time. From the 1880s, when poor whites and blacks fought together for representation and equality as a majority population of laborers in the city, to the 1910s, where whites argued over the placement of a door for a black congregation’s church, West Duval Street certainly experienced a profound transformation. This deep-rooted segregation, promoted by the rich white population of the city, resulted in the economic and racial breakdown of the city. 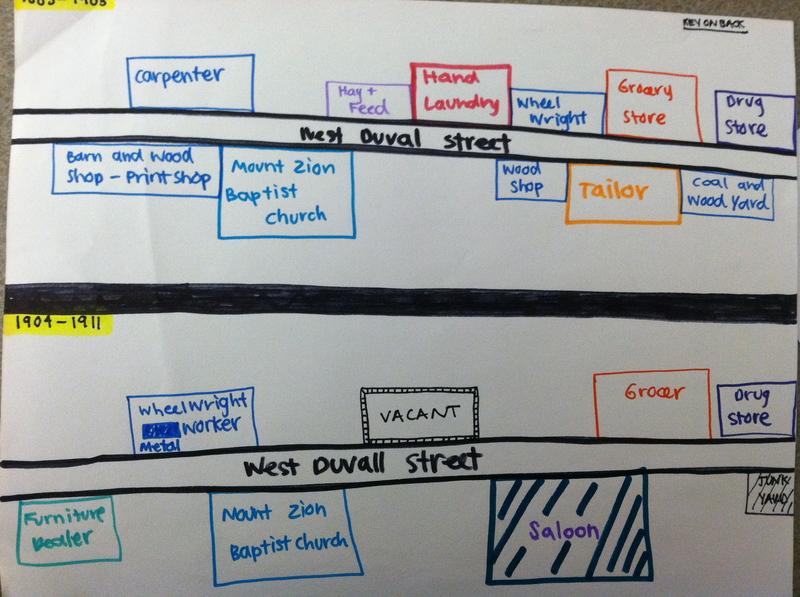 West Duval Street showed the trend for poor black laborers to be confined in the residential blocks north of Jackson Ward, economically isolated from the rest of the city. Professor W. E. B. DuBois explains the suppression of the black population of Richmond: “the disfranchisement of the black population is not a matter of interest to a single group…it is wrong to think that the best interests of this land demand disfranchisement, economic slavery and spiritual death of one-eighth of its citizenship. It is a serious thing when a great nation allows itself to drift into such a state of mind, that the fate of no human soul can fail to be of interest to every other human being- it is the tremendous fact that when in a republic you tamper with the right to vote, carelessly, ignorantly, or vindictively, you are mining the very foundation of the nation and the nation must not, dare not, look on in silence and apathy. ” The future of the city of Richmond was blighted by the inhumane acts of Richmond’s rich white population to ignore the best interests of one-eighth of its population. This white supremacy movement held back the City of Richmond for generations. Richmond City Directory. 1884, 1885, 1991. VCU Library. “Sixth Mount Zion Baptist Church.” Last modified September 21st 2009.http://www.library.vcu.edu/jbc/speccoll/vbha/6th10.html. African American Registry. “A Special Spiritual Voice, John Jasper.” http://aaregistry.org/historic_events/view/special-spiritual-voice-john-jasper. Black Americans in Congress. “The Negroes’ Temporary Farewell.”http://baic.house.gov/historical-essays/essay.html?intID=5&intSectionID=25. Richmond Times Dispatch. “John Jasper.” Last Modified March 24th, 2011. http://www2.timesdispatch.com/special_section/2009/feb/11/john_jasper-ar-80032/. Conell, Carol, and Kim Voss. “Formal Organization and the Fate of Social Movements: Craft Association and Class Alliance in the Knights of Labor,” American Sociological Review Vol. 55, No. 2 (1990): 255–269 in JSTOR. Angel Price. White Trash: The Construction of an American Scapegoat. “Race” http://xroads.virginia.edu/~ma97/price/open.html. Richmond Planet. (Richmond). October 10, 1903. http://chroniclingamerica.loc.gov/lccn/sn84025841/1903-10-10/ed-1/seq-4/;words=supremacy+white. Richmond City Directory. (Richmond) 1895, 1908, and 1911. Richmond City Directory. 1908, 1911. Dark areas indicate predominantly black areas of the city.